As already described in “Breed history” the breed was very distant to the origin. From the reliable, highly esteemed working dog it became a pure show- and family dog. Such a development seldom is an advantage ...and in case of the Clumber Spaniels it doesn’t agree to the breed. "natural working dog". “To restore to the breed physical soundness and the essential qualities needed by a working spaniel game sense, stamina, agility, willingness to please, ease of being trained, modest size and weight, freedom from hereditary defects and freedom from exaggerated features encouraged by breeding for appearance only...” (Originator: WCSS) This commitment, were enshrined in its rules. The WCSS is a platform for all holders of these extremely capable hunting dogs which are interested in the use of the breed and the training. road to meet our Velvetchen and take her home. 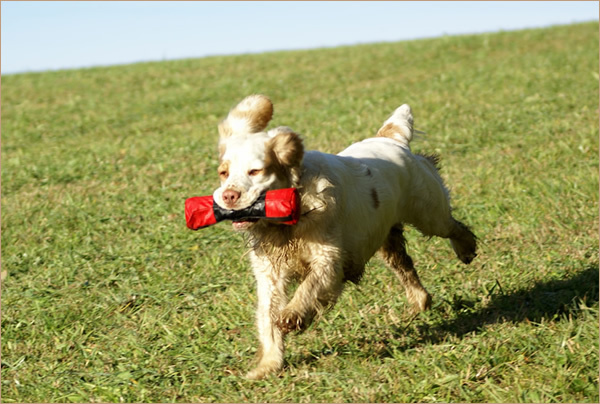 Nevertheless, we are not hunters, we try to adapt the training to the tasks and natural abilities of the Clumber Spaniel, wherefore Velvet also shows a natural talent and what makes great fun not only to her. If I read today in breed descriptions something of the kind: "it slavers, snores and gasps," it makes me not only angry at the author - who has unfortunately failed to visualize a complete picture of this breed, but also sad that the persons responsible for breeding allowed that these wonderful dogs were narrowed to it. By the way, the statement a Clumber from a working line is more difficult to train, is not true – au contraire. At last, only the Clumber Spaniel which forms a good team with its attachment figure, is an successful Gundog, what is certainly respected even at breeding.